Alright, I finally cracked open G.K. Beale’s 962 page beast, A New Testament Biblical Theology: The Unfolding of the Old Testament in the New. It’s been staring at me, tempting me with it’s theological awesomeness, so I finally gave in. At about 60 pages in I can safely say this is going to be a watershed work in New Testament studies. Describing the project in a short blog-post while doing it any sort of justice is next to impossible, especially when you consider the fact that Beale’s own description takes him about 25 pages. 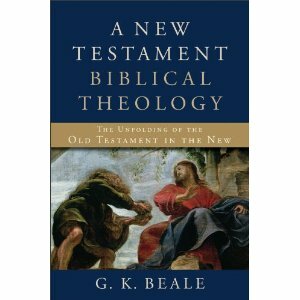 Still, the title alone points us to fact that one of the main thrusts of Beale’s work is to show how the New Testament can only be understood as the unfolding of the grand story-line of the Old Testament. In order to do so, he opens with a summary and theological analysis of that story-line, beginning with a focus on the first 3 chapters of Genesis. He pays special attention to Adam, the concept of the Image of God, and the eschatological thrust of the creational command to “conquer and subdue” the earth and “be fruitful and multiply” (Gen. 1:28), themes of crucial importance for understanding the rest of the tension and story-line of the OT. In light of these observations, we can speak of the prefall conditions as a “beginning first creation” and the yet-to-come escalated creation conditions to be a consummate “eschatologically” enhanced stage of final blessedness. The period leading up to the reception of these escalated conditions is the time when it would be decided whether Adam would obey or disobey. These escalated conditions indicate that Adam was in a covenant relationship with God. Although the word “covenant” is not used to describe the relationship between God and Adam, the concept of covenant is there. God chooses to initiate a relationship with Adam by imposing an obligation on him (Gen. 2:16-17). This obligation was part of the larger task with which Adam had been commissioned in Gen 1.:28: to “rule” and “subdue” creation and in the process to “be fruitful and multiply and fill the earth.” Adam’s “ruling and subduing” commission included guarding the garden from any threat to its peaceful maintenance. In light of Gen. 2:16-17 and 3:22, Adam would receive irreversible blessings of eternal life on the condition of perfect faith and obedience, and he would receive the decisive curse of death if he was unfaithful and disobedient. Thus, the discernment of irreversible escalated creation conditions discussed above is the best argument for such a covenant notion. Again, these conclusions come after a solid examination of the texts (pp. 30-41), and is followed by reinforcing argumentation (pp. 43-46). Still, I found this passage to be helpful in showing that to speak of God’s creational covenant with Adam, or a “covenant of works”, is not an obvious imposition of foreign concepts onto the text in order to fit it into a theological grid, as is so often charged. Rather, something like this is positively required by a close, narratively-oriented reading of the text. As I continue to dive into this ambitious, and already thoroughly rewarding work, I’m sure more excerpts and summaries will follow this.